Rebecca Quinn was born in DC and raised in Fauquier County, where she currently resides. Rebecca graduated from George Mason University in 2003, with a Bachelor’s degree in Educational Leadership and Transformation. Her interest in how people learn and transform themselves has its mirror in the clay she loves so much. Rebecca began her art career in conjunction with her teaching career. Initially, she took summers off to create independent bodies of work in drawing and painting, clay, and mosaics. Predominately self-taught, she used her summer collections to obtain a full scholarship to the Corcoran College of Art and Design in 2011. By 2012, she was team-teaching in the sculpture department (Clay, Stone, Metal) to adapt materials and course requirements for students with disabilities. Her Master’s exhibition was in Book Arts and Printmaking, guided and inspired by the printmaker Georgia Deal. Rebecca received her Master’s in Art Education from the Corcoran in 2014, earning several awards, including the Art Education Faculty Award and the Outstanding Achievement in Leadership Award. Post graduation, Rebecca’s work has earned seven portfolio awards from the Corcoran curators -- two in clay and five in metal and book arts. She has participated in several group exhibitions in Fairfax and Washington, DC. She currently teaches Art at Saint James Elementary School in Warrenton, Virginia. Rebecca was recently awarded a five year grant to learn, grow and teach Art in Virginia. 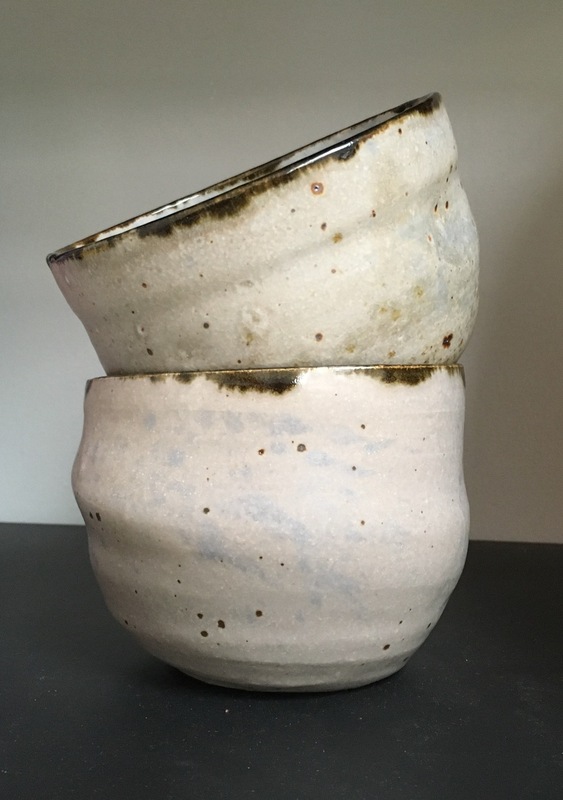 Her recent projects include a mobile pottery studio that will enable her to teach during her summers, in communities that do not have access to kilns, wheels and ceramics instructors. We all wear our past, visually or not. We are made and we are makers. Clay is nothing, if not honest. Bearing the marks, movements and scars of transformation. Sipping from a handmade mug, is to sip poetry. A crucial step to understanding life, creation and art. Although I do not fully understand breathing, I know I need it. The war privately waged against the ever-encroaching attachment to technology, is fought using clay at the wheel, coil by coil, intuitively. A splattered, joyful, mud-coated peace resides there -- in the hum of the wheel -- in the object making. True claywork uses ancient processes, avoiding mass production altogether and leaving the seeking of “perfection” to others. Adapting to changes; serendipity is a “secret weapon” by choice. the fire arranges a final testing ground for my labors. On process: Complexity and curiosity exist in a variety of forms, I have learned to be patient, wait, watch and let ideas, shape and form emerge. I am becoming more and more intrigued by the things left unsaid. (The clay takes an edit, as easily as the page.) The beauty of natural elements is timeless. The textures and colors of clay have an innate visual strength. I hope to honor that strength in my making.